Are you an a tournament poker player who wants your voice heard on the rules of the game? 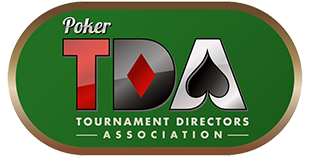 If so, the Poker TDA Players Coalition is for you! The coalition consists of individual players, player’s groups, and player advisory councils dedicated to improving and standardizing tournament rules. You can participate in the coalition in several ways, and you will be notified of player’s advisory meetings in advance by email. • Via an online TDA Player’s Conference: held on several dates prior to the biennial TDA summit. • Via pre-Summit questionnaire: critique current and proposed rules via the questionnaire circulated 30 to 60 days prior to each Summit. You will receive notice via your e-mail on record. • Also, join or start a player’s council at your local tournament location. If you primarily play at one or two venues, this is a great way to let your TD know your rules suggestions. Choose the avenue(s) that are right for you and have your voice heard on these important matters!